Happy World Whisky Day! Today is a special celebration of one of Scotland’s iconic drinks and the perfect excuse to enjoy a wee dram. With a royal wedding underway too, it seems quite fitting to raise a glass and celebrate.In Glasgow we are spoilt for choice in terms of places to sample a fine malt. Below are our current top 5 pubs we recommend you go for a special whisky today (or any day!). Located on Hope Street, this charming traditional Scottish pub offers Hundreds of malt whiskies, varied in style, strength and maturity. The Pot Still believe that everyone can find a dram they love. They also offer delicious homemade pies such as haggis, chicken, ham and leek and also lots of vegan options too. (Pot Still team pictured above). Formerly Kelvinside Parish Church, this buzzing arts and entertainment venue comes with an impressive Whisky Bar with over 280 malts to choose from. You’re always guaranteed a warm Scottish welcome in this cultural melting pot. The John Muir Room Conservatory and Lounge is adjacent to the Whisky Bar, which offers a comfortable and relaxed surrounding to enjoy breakfast, lunch or dinner. 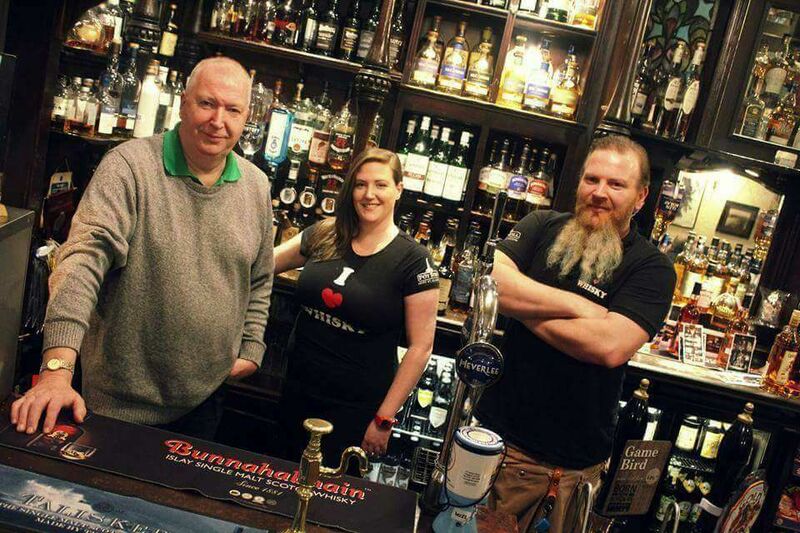 Located in the up and coming Finnieston district, the Ben Nevis bar is crammed with a wide variety of single malts and delicious local beers. With live music and friendly staff, everyone is always welcome – including dogs. Bon Accord is a popular malt whisky and aleshouse bar in Glasgow. Having been established for over 40 years, the team are trained at a number of local distilleries, such as Auchentoshan. They have an impressive knowledge of whisky and over 350 malts available for you to try. There is also a whisky shop. Dram is another one of our many great whisky bars in Glasgow. This hidden gem is located in Glasgow’s West End. You’ll find an interesting range of over 70 malts, alongside tasty home cooked food and superb coffee.